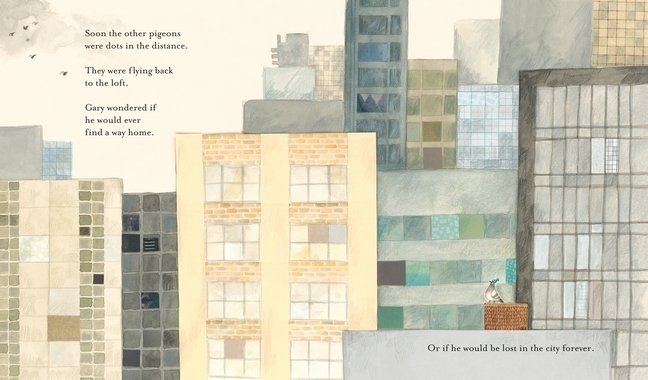 With her second authored and illustrated picture book, Leila Rudge proves that she has a true gift for telling stories about fitting in and standing out, an often overworked theme in picture books. With her debut, A Perfect Place for Ted, Rudge told the story of Ted, a "smart dog with his own sweater" who tries everything to get noticed, finally finding his perfect place as a friend to Dot, a girl with a house full of cats. 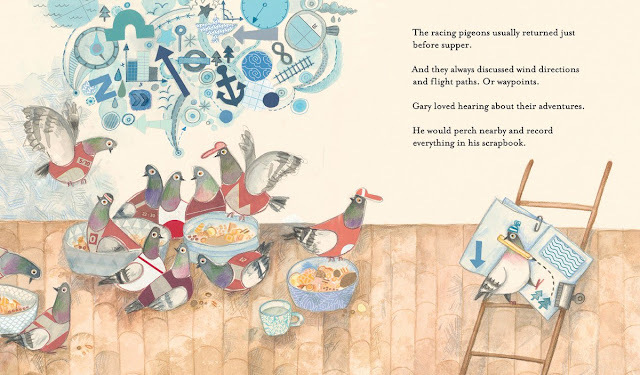 With Gary, Rudge creates a racing pigeon who can't fly, like the rest of his flock, but has big dreams of travel. 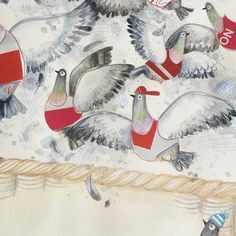 Gary is just like the other birds in his flock, but on race day he stays home because he can't fly. But, he has a taste for adventure, a keen ear and a growing scrap book. Perched nearby, Gary listens as his flock-mates discuss wind direction, flight paths and waypoints the night before a race, recording all this in his scrapbook. 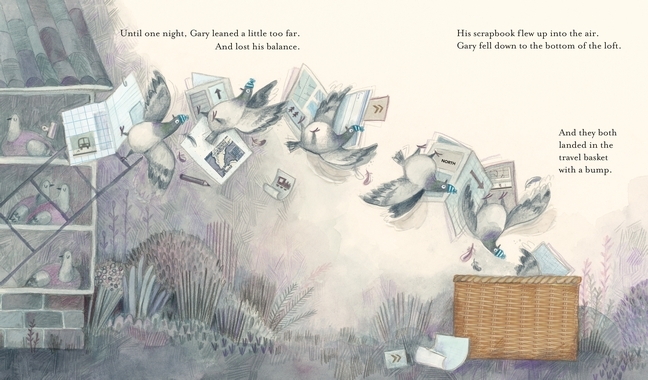 A series of mishaps leaves Gary stranded in the city, his flock mates flying off to race. But, Gary has his scrapbook with him and, as he tries to perk himself up by perusing his "collection of travel mementos," the city begins to feel a little more familiar to him and he feels a little less lost. Gary makes his way home in time for dinner with "new travel mementos for his scrapbook. And the most adventurous adventure story. Gary couldn't fly, but he had been everywhere!" Just like Ted, Gary finds a way to stand out and be himself while also fitting in. Rudge's illustrations are absolutely superb - gentle in palette, a little like Gary and his story. Rudge's mixed-media illustrations are beautifully suited to Gary's scrapbook and the mementos and maps that are part of the story. 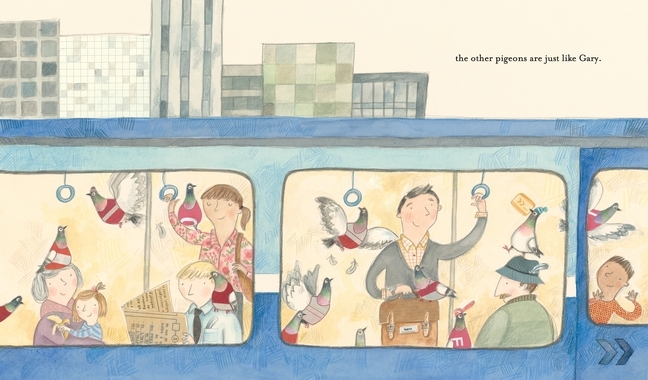 And, with her soft pencil work, Rudge manages to make pigeons truly beautiful. Of course, Gary's knit cap adds to his charm! 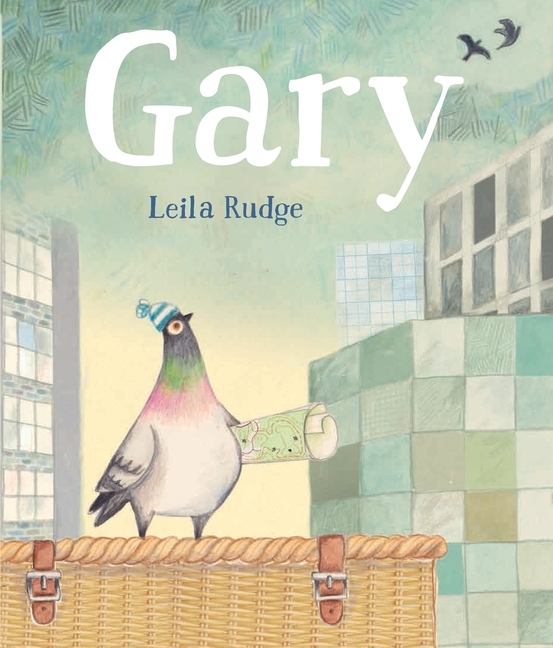 Gary is a marvelous, wonderful picture book that is visually rich and inviting and Rudge's story of a character with physical differences who challenges the norm is a subtle and sweet addition to any book shelf and any family.